Pope Francis, in the Catholic Church's first encyclical on the environment, Laudato Si, asks people to care for "our common home" so that future generations might also enjoy it. MIAMI | Everything in nature is recyclable, except the garbage produced by people. Animal excrement serves as plant fertilizer, as do animal’s carcasses when they die. But the garbage produced by people is accumulating at a tremendous rate. Enormous quantities of plastic are winding up in the ocean, where they decompose into microscopic particles that get eaten by fish – and eventually people, when they eat fish. This creates an irritant in the human immunological system. In 2015, Pope Francis published Laudato Si, the first encyclical in 2,000 years of Church history that deals with the environment. In it, the pope invites people to develop a holistic ecology and a matching ecological spirituality. “Who doesn’t like admiring a setting or rising sun, a forest in the mountains, an ocean. We like it but we have to protect it. We have to protect it so future generations also can enjoy it,” said Father Cioffi, who holds a doctorate in moral theology from the Gregorian University in Rome and a doctorate in genetics from Purdue University in Indiana. After the publication of Laudato Si, Father Cioffi sought to make the encyclical better known. So in the fall of 2015, he and his colleagues at St. Thomas hosted the first Conference on Climate, Nature and Society, which focused on the scientific, theological and social aspects of caring for the environment. Experts spoke about the scientific evidence for climate change, especially the human factor, as well as the social impact. Ghana’s Cardinal Peter Turkson, author of one first essays on Laudato Si, was among the speakers. 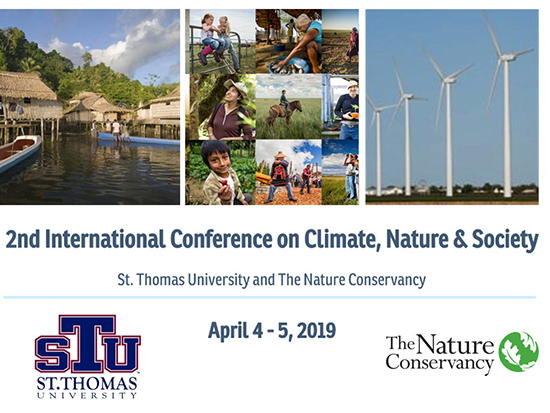 Three years later, St. Thomas has teamed up with The Nature Conservancy to host the second International Conference on Climate, Nature and Society, set for Thursday and Friday, April 4 and 5. This second conference has a religious angle, Father Cioffi said. In addition to specialists on the subject, Christian, Jewish and Muslim leaders have been invited, along with Archbishop Thomas Wenski, to speak on how the different faith traditions care for nature. “Care for creation is very important,” said Nelson Araque, theology professor at Cardinal Gibbons High School in Fort Lauderdale and ambassador for Hispanics at the Catholic Climate Covenant, an organization dedicated to spreading Church teachings on climate change and care for creation. The harm being done to the environment is documented in scientific studies that show sea level rising due to melting polar ice caps. This phenomenon is caused by the accumulation of carbon dioxide in the atmosphere – a greenhouse gas that causes heat to gather, and results from the use of coal, oil and natural gas. Of the 50 U.S. states, Florida is the most at risk of flooding from rising sea levels. According to Father Cioffi, the state is, on average, about six feet above sea level. Miami Beach is one of the most affected cities, but has already drawn up contingency plans, such as installing pumps to drain the water in times of flooding. At the same time, the world has surpassed the target for global warming called for by the Paris accord in 2015, which was 1.5 degrees centigrade. “It is projected that we will reach 3 degrees centigrade, which is double what had been proposed as a safe limit,” Father Cioffi said. The countries that generate the highest levels of greenhouse gases, according to a 2017 report from the United Nation’s High Commissioner for Refugees, are China and India, but also the U.S.
Pollution caused by harmful particles suspended in the air in places such as China and India causes the premature deaths of more than 1 million people a year, according to a 2017 study from Health Effects Institute in Boston and the Institute of Health Metrics and Evaluation in Seattle. The effects of climate change also are visible today in increased flooding and more intense waves of heat and cold. Pope Francis speaks clearly about what should be done in Laudato Si. “The little things we do can turn into big things when we set the example,” said Araque. He noted that seeing someone do something motivates another person to do it as well. And when it comes to care for the earth, Hispanics especially understand the connection since so many have worked in the fields. “We have to read the encyclical, Laudato Si, a teaching which obligates us to act, and we should teach it in our schools,” Araque said. 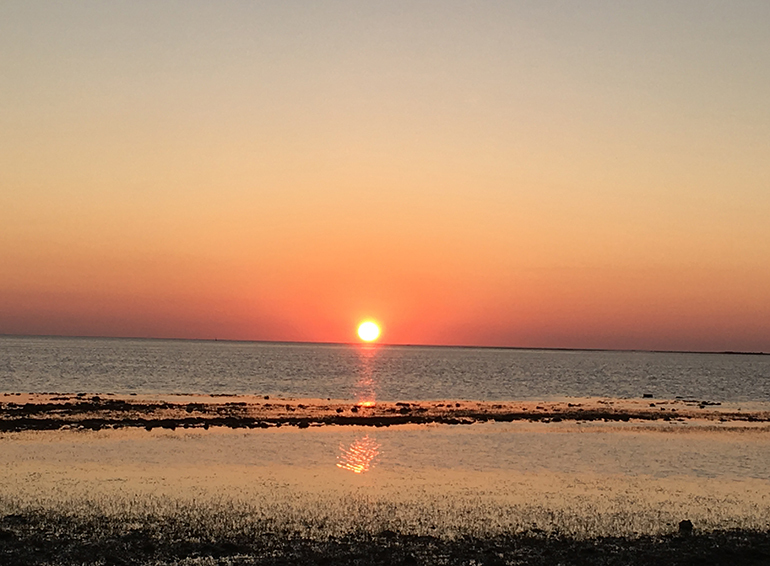 At the same time, parishes should create activities that promote care for creation: simple things such as recycling, picking up trash from the beaches, increasing awareness about pollution and committing to not use plastics. Young people in Miami are aware of the need to care for the environment, but only to a point, Father Cioffi noted. They don’t realize the extent of the pollution caused by plastic water bottles. “We have to get rid of plastic bottles because they have become an addiction. That plastic bottle is going to contaminate the environment for centuries and centuries,” he said. “I’ve lived in Miami almost 50 years and have drunk water from the tap in the southwest and the northwest, in Hialeah, in Brickell, in Miami Beach, and I’m perfectly healthy. Healthy enough that I was able to donate a kidney,” he added. Second International Conference on Climate, Nature and Society. April 4, 9 a.m.-5 p.m., and April 5, 9 a.m.-noon, St. Thomas University, 16401 N.W. 37 Ave., Miami Gardens, 33054. Free admission but seats are limited. All talks will be translated simultaneously to Spanish. Speakers include: Miami Archbishop Thomas Wenski; Tebaldo Vinciguerra, Pontifical Council for Integral Development; Rev. Dr. Jim Antal, author, “Climate Church, Climate World”; Jan Booher, Climate Change Working Group, The Unitarian Universalist Fellowship of Boca Raton; Pam McVety, biologist, First Presbyterian Church, Tallahassee; Susy Torriente, chief resilience officer, Miami Beach; Hardeep Anand, Miami Dade Water & Sewer Department; Rabbi Jeffrey K. Salkin, Temple Solel; Jayantha Obeysekera, Sea Level Solutions Center, Florida International University;Rajiv Krishnan, Coastal Risk Management.